It’s been three years since I last heard your voice over the phone saying you’d call me right back. I don’t know if you know what happened. But, you were on a road call, at work, changing tires for a motor grader and had a fatal heart attack. I was at home and had this lonely feeling that prompted me to give you a call. Clearly, you were out of breath which isn’t uncommon. You told me you’d call right back, but when you didn’t and wouldn’t answer your phone I called your boss. They told me something happened and they thought you might have died. 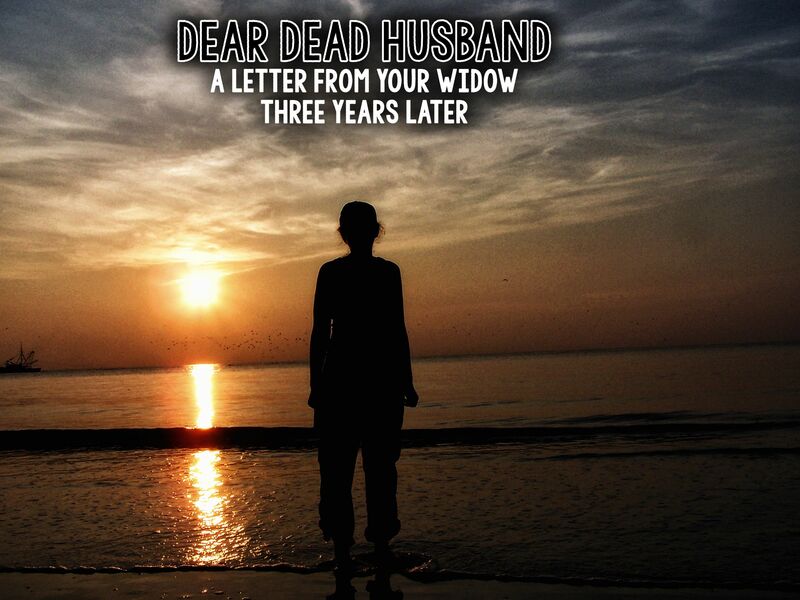 It’s not easy to write to a dead man, which is why I’ve avoided it for over 3 years, now. Not for obvious reasons like you’re dead and can’t read it, anyway. It’s just not easy to think about the fact that you’ve missed the past three years. It’s not easy to think about you missing out on all the rest of them, either. But, I’m gonna do it, today– the eve of your youngest son’s 11th birthday. After all, his was the first birthday we celebrated without you after you died. I continue along the path we had envisioned for our sons, together, and move through this life without your presence. There have been some challenges, but you know me well enough to rest assured that I overcome them all and make it look easy. But, it’s not easy. It’s the hardest thing I’ve ever done in my life, to raise the boys without their daddy. I think about the things that you wanted to do–or things I am pretty sure you’d love– and I make it a point to do them for you. I had elk tenderloin for dinner the other night.. I know you would have loved that. The carolina trout was fantastic, too. For a long time, it was really difficult to do the things you loved and things you’d dreamt about doing and things I know you would have enjoyed.. I did what I could, despite the deep and cutting pain. Now, it doesn’t cut so deep. There’s still a pain, there, where you should be–but, it’s changing. It brings me something else, now.. a connection to the spirit you shared on planet earth, a content and happy spirit of perseverance and simplicity. I introduce your sons to things I thought that you would show them one day. We’ve been camping–a lot. Sean and James even start and tend the fires, all by themselves, now. We spent two nights on Cumberland Island. Remember, we’d talked about doing that when they got a bit older? Well, we did it. Standing all alone out on that isolated beach, as the sun set, was possibly the most simultaneously painful and glorious thing I’ve ever done, besides give birth and bury my husband. It’s indescribable. I’m thinking you might know what it feels like. While we were there, I’m pretty sure we heard a space shuttle take off from that place in Florida. It was super loud and I checked the internet and they had a launch scheduled. I remembered you saying you heard it–or saw it– when you were in South Georgia, close to the Florida border. We went boating in the Okefenokee–I remember the stories, of your friend with the alligators all laying in his yard like tired dogs. We took a road trip around Florida and saw even more alligators in the Everglades and Big Cypress National Preserve. James played in some big waves. Remember, how much he loved the waves when we visited Jekyll Island? He loves them even more, now. I took him to the Keys and he was almost in tears over the calm water! I took Sean to see manatees, in the wild; and we swam with dolphins, Dave. We swam with dolphins and it was amazing. We hike mountains–James loves the amazing views. He said his favorite part of our hikes are the plants and Sean is amazing at identifying them. That kind of surprised me. I remember you telling me that you and your friend built your own kayaks and took them out on the river. We went kayaking with an ecologist, in a National Estuarine Research Reserve. That experience inspired me and sent me back to school to become one of those guys. I’m attending an Outdoors Woman workshop in October to learn how to fly-fish.. Because, you said you always wanted to do that. I’m doing it for you and I’ll be able to take your sons to show them your dreams and teach them the things you would. I’m learning. Tomorrow, for James’ birthday, we’ll be learning how to ride dirt bikes–one of your favorite past times. I hope he enjoys it as much as you did and as much as he loves mountain biking. Did I tell you we go mountain biking? I gotta get some sleep, Dave. 5:30AM wake up call for us new dirt bikers. One last thing, I made this video for you. I often find myself thinking about how you must be so worried about me, if you hadn’t heard anything from me. I tried to answer all the questions, I imagine you’d have, with the video.. How have you been? What have y’all been doing? Is everything OK? Those last frames with my “Thumbs Up..” It’s become my default pose and it’s been my secret that those are all for you.. they’re all to let you know that everything is good. We’re OK. Thanks for blessing me with an endless supply of unconditional love, lifting me up and strengthening my freedom to be me. I may not be a rich woman, but I’m a very wealthy being– and, much of that wealth was acquired during my life with you. I strive to be able to share that with your sons and as many people as I can. I know you’d be proud of your little family and how they drive their time machines along through the universe. Oh, Candy. Know that I’m thinking about you, and if you ever want to talk to someone who has been there, I’m around, okay? Jill, it would be nice to have a chat with someone who can understand on the same level of pain it causes. It’s a difficult thing to master – life after a love and loss like that. What a beautiful post….I’m terribly sorry for your loss. I love that you are still living out your husbands dreams with your children. Hugs. Thanks for giving me your thoughts, Melissa. These comments are like hugs from all y’all! Beautiful and real. Candy, you are an inspiration and an amazing mom to those boys. Your husband is so proud of you, I just know it. Absolutely beautiful post. I’m crying and I don’t even know you. I know it must have been painful to write, but it is such a testement to the commitment you have for your boys. The video brought me to tears. Thanks for sharing a part of your soul. Thank you, Ann. It was definitely one of the most difficult writings I’ve done. I appreciate that you and everyone took the time to read and leave your thoughts. I’m speechless, which doesn’t happen often. That was so beautiful and so raw. Thank you for sharing that piece of yourself, of your family. I know I’ll see every adventure I read about you doing in a completely different light now. You are an amazingly intentional mom! You help show the world not to waste moments. By the way- dirt biking and fly fishing rock! Those are two of our family favorites. Hope you enjoy them as much as we do! Thank, Lori! After spending some time with you at the conference, it IS hard to imagine you speechless LOL. All kidding aside, thanks for hunting me down and spending some time with me at the conference. Oh, my. My heart is caught somewhere between my chest and my throat, reading through this. Thank you for sharing such a candid, courageous piece of your life. That you are living your life, with a piece of him and through pieces of your husband, are a solid example to your sons, who will continue to live their lives, knowing their mother made great strides to give them an amazing world, even if one star was no longer shining here on earth. God bless your strength, and may it continue to carry you through. Thanks for your kind words, Barbara 🙂 It means a lot that you took the time to share them with me. Love, light, prayers, beautiful thoughts coming your way. Thank you for being you. What a wonderful post thank you so much for sharing. Sad to hear about your loss but great to hear you are doing well.